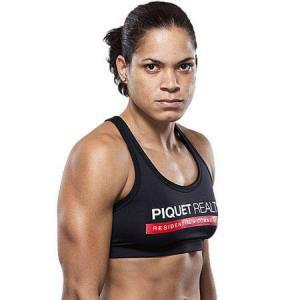 Amanda Lourenco Nunes was born on 30 May 1988, in Salvador, Bahia, Brazil, and is a mixed martial artist, best known for fighting as a part of the Ultimate Fighting Championship (UFC), in which she is the UFC Women’s Bantamweight Champion. She has been active in the sport since 2008, and all of her efforts have helped put her net worth to where it is today. How rich is Amanda Nunes? As of late-2017, sources estimate a net worth that is at $1 million, mostly earned through a successful career in mixed martial arts. She has a record of 15 wins with the majority via knockout. As she continues her career, it is expected that her wealth will also continue to increase. Amanda started training in martial arts at a young age, starting with karate before later moving to boxing. She also trained in Brazilian jiu-jitsu thanks to her sister inviting her to train in the sport. Eventually, she pursued mixed martial arts as a career, and moved to New Jersey to train with the AMA Fight Club, before relocating to Miami to train at MMA Masters. In 2008, she made her mixed martial arts debut at the “Prime MMA Championship 2”, in a fight which she lost. Nunes bounced back from her loss and would win five straight fights via knockout. This led her to join Strikeforce, and her net worth would slowly increase. She won her first match with the promotion, and continued to fight there until 2012, when she would lose a match against Alexis Davis. Nunes then joined Invicta FC to fight Milana Dudieva, but an illness led Dudieva to withdraw from the fight. Nunes eventually fought Raquel Pa’aluhi, and would win the match. In 2013 she fought Sarah D’Alelio and lost the fight via unanimous decision, but during the same year, she made her UFC debut at UFC 163 against Sheila Gaff, winning via a TKO in round one. Amanda’s next fight was a win against Germaine de Randamie, then the following year she lost to Cat Zingano. Afterwards, she would win matches against Shanya Baszler, Sara McMann and Valentina Shevchenko, and this winning streak earned her a title shot against Miesha Tate for the UFC Women’s Bantamweight Championship, in 2016 at “UFC 200”, and Amanda would win during the first round via a rear naked choke submission. This made her the first openly gay champion in UFC history. She would then defend her title against Ronda Rousey at “UFC 207” which she would win via TKO during the first round. One of her latest fights was against Valentina Shevchenko at “UFC 213” which she would win via a split decision. For her personal life, it is known that Nunes is a lesbian, and is in a relationship with UFC fighter Nina Ansaroff who competes as a part of the strawweight division. Nunes has mentioned that the relationship is the reason for her success.